med en av Kristas Digis från saturated-canary. Det var ett tag sedan och nu har jag köpt lite nya från henne. with one of Krista Digis from saturated-canary. It was a while ago and now I have bought some new ones from her. Denna digis heter Pint Sized Love. Jag kan ju inte motstå att köpa den då det finns med en liten katt. Jag har målat henne med promarkers/flexmarkers. This digis called Pint Sized Love. I can not resist buying it when there is a small cat on it. I have painted her with promarkers / flexmarkers. lush green, pastel green, mint green, raw sienna, daffodil bloom. och den fina spetsen har jag köpt hos Hannaspysselstuga. and the fine lace I bought at Hannaspysselstuga. och därför har jag valt dessa färger. Papperna kommer från Pad papiers och heter Isabelle. Jag har följt en skiss sweet sketch wednesday. and therefore I have chosen these colors. The papers come from Pad papiers and named Isabelle. 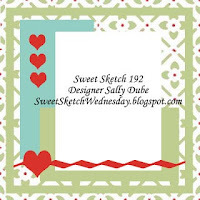 I have followed a sketch sweet sketch wednesday. love the image, papers, flowers, colours and fab sketch. Aboslutely stunning card. I love all the detail work you hae added. Your embelishments and trim are beautiful. Stunning job coloring up your image too! Thanks for sharing your card with us. 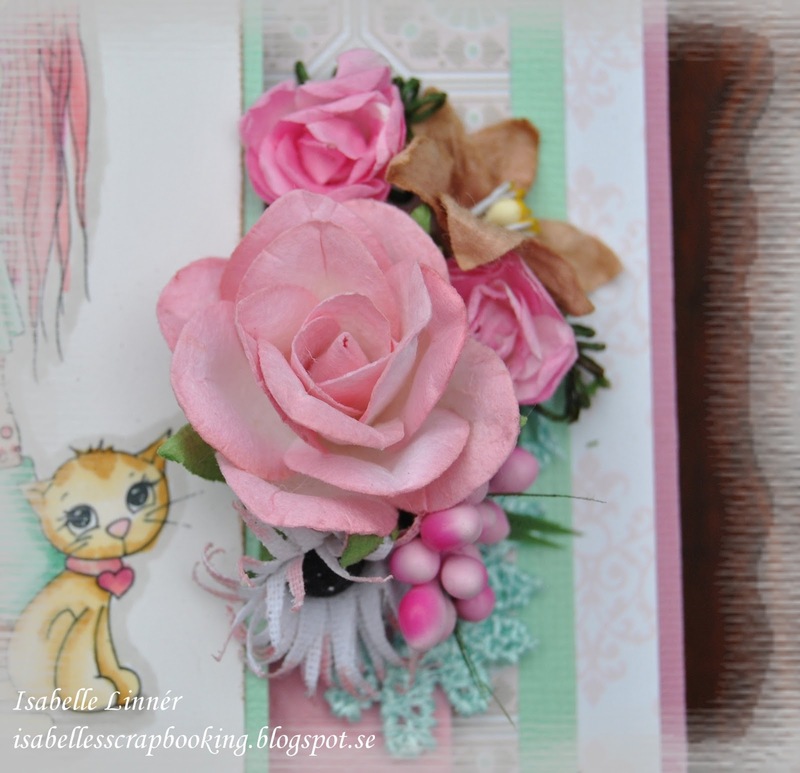 This is gorgeous Isabelle, I like the image the papers the lovely colours and the flowers. Super cute card! 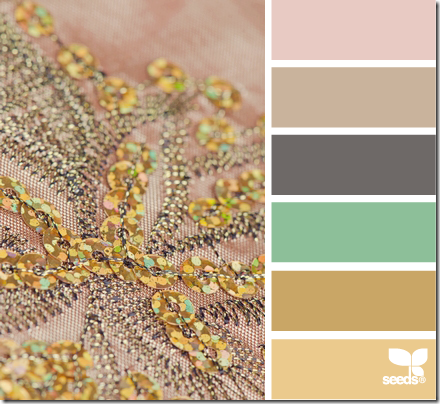 Love your coloring and what beautiful embellishments. Thanks for joining us at SSW. How beautiful! Love your image and soft colors. And your embellishments are pure perfection. Thanks for joining us at Sweet Sketch Wednesday. 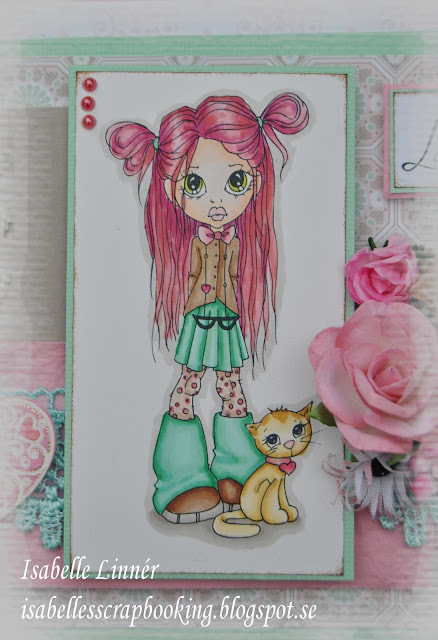 Oh Isabelle, your card is so lovely I just adore this image from Saturated Canary and your wonderful colours especially her hair. 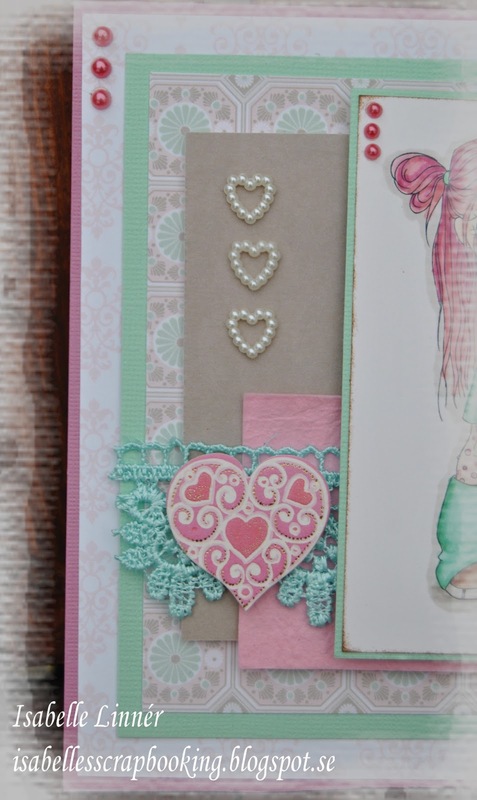 Great design papers and your added embellishments are the most perfect finishing touches to your lovely card. Thanks so much for joining us this week over at Sweet Sketch Wednesday hope to see you again next week and good luck. LOVE the pink hair!! This is just fabulous! Thanks so much for joining us this week at Sweet Sketch Wednesday. A lovely creation. Thanks for sharing with us at Dream Valley and good luck. This is just a gorgeous card - I love the image with the little cat - so cute. Thank you for joining us over at Totally Gorjuss and I wish you the very best of luck. I hope you will come and join in with us on our next challenge.